Rackmount Multi-Port Ethernet Extender DSLAM Concentrators. 8-Port Gigabit Ethernet 1U DSLAM provides 8 secure ports of LAN data services up to 24,000ft or 7.3km distance over a 1-pair (2 wire) telephone line wiring or better. 16-port Gigabit Ethernet 1U DSLAM is a 1-pair Managed solution that drives Ethernet data up to 24,000ft or 7.3km distance over a 1-pair (2 wire) telephone line wiring or better. 24-port Gigabit Ethernet 1U DSLAM is a 1-pair Managed solution that drives Ethernet data up to 24,000ft or 7.3km distance over a 1-pair (2 wire) telephone line wiring or better. The Enable-IT™ 8908 8 Port Gigabit Extended Ethernet DSLAM is a 1-pair Managed solution that drives Ethernet data up to 24,000ft or 7.31Km distance over a 1-pair (2 wire) telephone line wiring or better. The Enable-IT™ 8916 16 Port Gigabit Extended Ethernet DSLAM is a 1-pair Managed solution that drives Ethernet data up to 24,000ft or 7.31Km distance over a 1-pair (2 wire) telephone line wiring or better. The Enable-IT™ 8924 24 Port Gigabit Extended Ethernet DSLAM is a 1-pair Managed solution that drives Ethernet data up to 24,000ft or 7.31Km distance over a 1-pair (2 wire) telephone line wiring or better. The Enable-IT™ 850 Gigabit Ethernet CPE is designed for use with the Long Distance Enable-IT 8908, 8916, 8924 or 8948 Extended Gigabit Ethernet DSLAM concentrator – encrypted and secure. 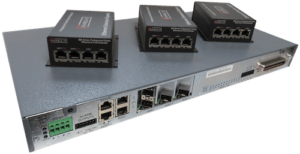 The Enable-IT™ 830 Ethernet CPE is designed for use with the Long Distance Enable-IT™ 24-port 8935 Extreme Reach Ethernet DSLAM concentrator.